Blog What is Drip System Hydroponics? Drip system hydroponics is the most popular of all the hydroponic systems. This type of hydroponics borrows the most water-efficient irrigating technique used in traditional cultivation and adapts it to a soil-less growing system that’s so simple, efficient, and versatile that it’s being used to produce bountiful crops by everyone from city dwellers living in small apartments to some of the biggest commercial hydroponic farms the world over. In this guide to drip system hydroponics, you’ll learn the basics of what drip system hydroponics is, what the two drip system techniques are, how the system works, and how to build your own, in addition to finding out why this system is so popular among hydroponics enthusiasts. In drip system hydroponics, the water-based nutrient solution is delivered to the root system of plants using drip irrigation. This type of low-flow irrigation is very water-efficient, avoiding waste due to evaporation by providing moisture via slow drip at the base of the plants rather than mimicking rainfall from above. When designed for plants in separate containers that are regulated individually, a hydroponic drip system will slowly and steadily provide moisture and nutrients exactly when and where it’s needed. Or, you can create a hydroponic drip system that automatically turns on to provide enough solution to saturate the growing medium in the root zone of your plants and then turns off to allow any unused solution to drain away. Vertical farming is another application that drip system hydroponics is well-suited for, as you just need to pump water to the top of the system and then let gravity do the rest. How Does Drip System Hydroponics Work? Using a pump located in the nutrient solution reservoir, hydroponic drip systems deliver the nutrient solution to the roots of plants via drip emitters. The pump is usually connected to a timer that automates the irrigation schedule. The system can be arranged so there’s at least one emitter delivering solution directly to the root mass of every plant. And if your emitters have mechanisms allowing you to control their output, you can adjust the amount of solution each plant receives according to the needs of that particular plant. However, drip system hydroponics doesn’t have to be that complicated. With simple vertical gardens, for example, all you need are the drip emitters at the very top. Regardless of whether it’s a vertical or a regular horizontal growing system, the nutrient solution will trickle down through the growing medium, and when it reaches the bottom, any that hasn’t been taken up by plant roots along the way will be either returned to the reservoir for reuse or discarded. There are two distinct types of drip system hydroponics: recovery systems and non-recovery systems. A recovery system is one in which the nutrient solution is recovered and recycled through the system multiple times. Recovery systems are the least technology-dependent of the two drip system techniques. These systems are what vertical gardens depend on to distribute nutrient solution from the top down. They work by slowly dripping the solution into the growing medium and allowing the unused portion to percolate down to the bottom before pumping it back up to the drip emitters. While recycling your solution may offer savings in the cost of nutrients, it requires that you carefully monitor the pH and nutrient levels of your solution, since they will change as the plants consume what they need during each cycle through the system. You will need to adjust the pH level as needed as well as periodically emptying out the nutrient solution reservoir and replacing it with a fresh batch of solution. Although it seems counter-intuitive, non-recovery systems can actually be more resource-efficient than recovery systems and are therefore the preferred technique for commercial drip system hydroponics growers. In order to be more efficient, though, the drip cycles need to be very precise. With highly accurate cycle timers, irrigation timing can be regulated right down to the second.And especially if the drip system is individualized for every plant, the growing medium around each plant can be moistened just enough that the plant will have the water and nutrients it needs and very little, if any, of the solution goes unused. Since you’re not recycling solution through the system, non-recovery systems simply require that you refill your reservoir as necessary with fresh nutrient solution, meaning there’s no need to monitor the reservoir for pH levels. With less precise irrigation systems, you may need to flush the growing medium periodically with clean water to remove any buildup of nutrients. Why Choose Drip System Hydroponics? Hydroponic drip systems are very simple to build and use for growing plants year round. You can build one with relatively inexpensive equipment. And you don’t need to be concerned about precision tuning of the system or worry that the plant roots will suffer from dryness if there’s a disruption of the watering cycle due to a blip in the power supply, as the growing medium will continue to provide moisture for a while after the dripping has stopped. Because it allows you to have a great deal of control over the drip locations, watering schedule, and nutrient amounts, drip system hydroponics can be both highly automated and very resource-efficient. As noted above, finely tuned non-recovery systems are usually more resource-efficient than recovery systems, but recovery systems can be much simpler to build. Perhaps the main reason drip system hydroponics is the most widely used hydroponic system is its versatility. This system can be adapted for small gardens as well as large-scale commercial operations and is appropriate for a variety of plants – including larger plants such as tomatoes,melons, and squash that other hydroponic systems can’t support. Also, you can design a hydroponic drip system as simple or as sophisticated as you like. This means it’s a great system for beginners to start out with, to which they could add layers of complexity as they gain the confidence that comes with experience. For example, you could put together a very simple drip system using lengths of drip line and a basic timer, and then design a more professionalized system with various drip irrigation components, a more precise timer, and customized nutrient feeding for each plant. What Are The Disadvantages Of Drip System Hydroponics? As with any type of hydroponics, there are a few downsides to consider when thinking about using drip system hydroponics to grow your plants. The biggest disadvantage to drip system hydroponics is that the drip emitters tend to become clogged. It’s a problem that can plague any hydroponic drip system, and the causes stem from either physical matter in the liquid solution or issues with the dripper tips such as algae growth and nutrient mineral buildup. Monitor the pH level of the nutrient solution in the reservoir according to the solubility of your nutrient formula to help ensure that the nutrients are fully dissolved. Check the drip emitters regularly, tapping them with your finger to loosen any sediment that may have accumulated there. Clean your entire system well between growing cycles to prevent buildup of algae and bacteria. This should involve both rinsing then sanitizing your growing medium and flushing your irrigation system out with nitric acid. You have a lot of flexibility with the growing container aspect of your hydroponic drip system. You can use one large container for all your plants, separated growing containers for different kinds of plants, or individual containers for each plant. Whatever growing container setup you use, make sure you have a way for the nutrient solution to drain out of the bottom and either get sent back into your reservoir or collected for discard. With drip system hydroponics, you need a growing medium that will support your plants and can hold water and air while providing good drainage. Suitable media include lightweight expanded clay aggregate,coco coir, and rockwool. For less precise irrigation systems, you can aid drainage by placing river rocks at the bottom of your growing containers. Your nutrient solution reservoir should be a closed container made out of an opaque material that doesn’t pass light, to discourage algae and bacteria growth. Make sure it’s situated so you have easy access for monitoring and refilling. You don’t need a high-powered pump for drip system hydroponics; a simple fountain or pond pump will do. You can also install an aquarium pump and/or air stone to aerate the nutrient solution and help ensure that the plant roots are maximally oxygenated. The additional oxygen in the liquid will encourage the roots to take up more nutrients and enable your plants to grow faster. Most hydroponic drip systems have a timer attached to the pump so it will cycle on and off several times a day. You don’t need a precision cycle timer, unless you are setting up a more sophisticated non-recovery system with maximum resource-efficiency. 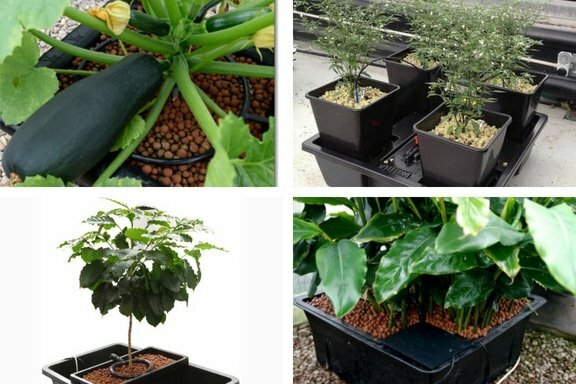 You will probably use a combination of irrigation components that may include PVC or flexible tubing, thin spaghetti tubing, drip line, a drip irrigation manifold, and connectors or fittings as needed to fit the unique design of your hydroponic drip system. To deliver the nutrient solution directly to the root zone of your plants, you’ll want to use at least one drip emitter or nozzle per plant. However, you can also set up a very simple drip irrigation system by laying tubing that has small holes poked in it along rows of plants. Vertical gardens are a special case of drip system hydroponics at work. Hanging gardens are popular with small-apartment dwellers and anyone who enjoys having some fresh herbs and salad greens available year round, since they can be constructed with recycled materials such as plastic bottles and are space-efficient as well as water- and nutrient-efficient. Stunning vertical “living walls” are also growing increasingly popular as architectural elements that bring a breath of fresh, verdant greenery into the heart of the concrete jungle. Of course, vertical gardens aren’t necessarily hydroponic, meaning you can use soil as your growing medium and just use plain water rather than nutrient solution to hydrate them. However, with hydroponics, you can grow healthier, faster-growing plants using lighter-weight growing media. Are There Hydroponics Drip Systems Available To Buy? If you’d rather jump right in and get to planting without designing and building your own hydroponic drip system, there are several companies that offer ready-made kits. Based in the Netherlands, Atami produces the Wilma line of hydroponics drip systems. You can also purchase a drip irrigation kit from a company such as Raindrip that’s made for use with traditional soil-based gardening and adapt it for your hydroponics system.